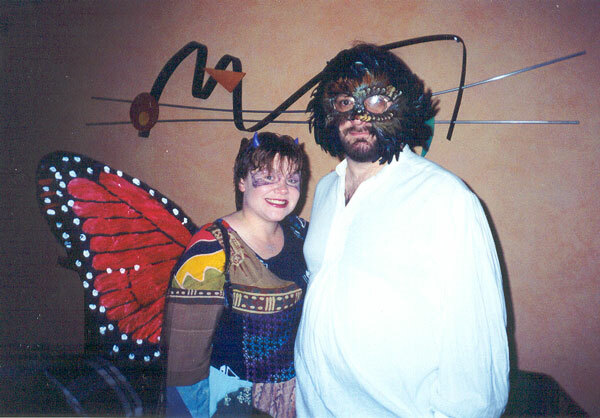 This is my Nils and I last Halloween. Usually the mask he's wearing goes on our wall! Nils is a children's book cataloguer and knows all the best bedtime stories. Our four year anniversary is May 6th. Hello, I am Nils E. Mikkelsen, the end product of three generations of selfless devotion to the state. In my life I have been many things, student, soldier, historian, and librarian. My hobbies are roleplaying, just now breaking away from my habit of playing arrogant, violence-prone, maniacs; reading, I highly recommend Patrick O'Brian's Aubrey-Maturin series to anyone interested in immersing themselves in the Royal Navy of the Napoleonic Wars, and collecting one-sixth scale military action figures, Blue Box Toys series is currently my favorite. If you're reading this then you already know I have the coolest girlfriend and cutest kitten in the world.